Starting in 2012 models, Subaru began using OEM navigation head units made by Fujitsu Ten. 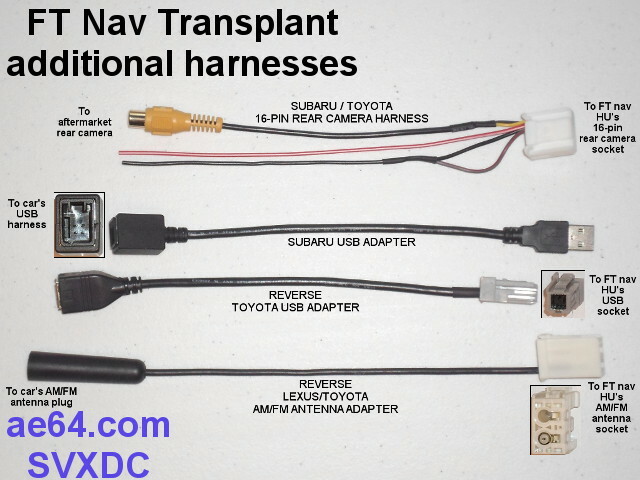 For owners of cars with non-navigation OEM HUs, "transplanting" (retrofitting) these FT nav HUs has become a popular upgrade. The best candidates for the transplant installation are cars with phone/Bluetooth buttons on the steering wheel and the factory BT microphone in the map light cluster. Specifically, non base-level 2011–up Impreza, OBS, WRX, STi, Crosstrek, and Forester. While you could install an FT nav HU into an older model that lacks the OEM BT steering wheel controls (SWCs) and map-light microphone (namely, 2008–2010 Impreza, OBS, WRX, or STi; 2009–2010 Forester; some later base levels of all of those models; and models with OEM Kenwood or TomTom navigation), I don't recommend it. The non-BT SWCs in those cars are completely incompatible (and attempting to retrofit the newer buttons is difficult and expensive). Similarly, trying to retrofit the proper map light cluster (with microphone) would require some new, custom wiring, and is not inexpensive (if you buy the cluster from a Subaru parts dealer). Those cars are better suited for the OEM Kenwood nav HU (or aftermarket). The best FT nav HUs are ones that came out of the above models (Impreza, WRX, STi, Crosstrek, and Forester). HUs from BRZ and Toyota models will work, but you will need to add a resistor to make the aux input work (more details later). If your car does not have the OEM harman/kardon amplifier and speaker system, ideally you'll want a HU from a car that also did not have the h/k system. Or if your car does have the h/k system, ideally you want an FT nav taken from a car that also had it. However, mixing should still work (h/k HU into non-h/k car, and vice versa). In recent cars with the Multi-Function Display (MFD), the FT nav will not display radio information (audio source, station, artist, song title, etc.) on the MFD (the FT nav lacks the necessary proprietary data interface). However, the FT HU displays much of that info on its own 6.1" screen. All other functions (non-radio) on the MFD will continue working as before. The FT nav HU will fit physically, and your OEM metal brackets will work fine. Hot tip: You should always save your original brackets for your own car. Your car's bezel/fascia will work too (the FT nav's face is essentially the same size as recent non-nav OEM HUs). However, the fascia in cars with the FT nav has rounded inside corners, and the HU opening scoops inward slightly more, making the HU look not quite as recessed. So you might prefer to switch to the OEM fascia for the FT nav (though this is purely for aesthetics). Check with people whose cars had a factory-fitted FT nav HU that they removed — they'll need to do the reverse to install an aftermarket HU (because all of the aftermarket dash kits have square outside corners, and won't fit the OEM FT nav fascia's rounded opening without modification). They might even want to trade you for your non-nav fascia! The factory location for the GPS antenna is above the instrument cluster, just below the dash. GPS signals have no trouble passing through the windshield and thin plastic dash. It's not difficult to put an aftermarket GPS antenna there. People have also gotten away with sticking it to the top of the FT HU's chassis. Your car's factory radio harnesses will have most of (and in some cases, all of) the signals that the FT nav requires. At worst, you'll need to find and tap into the car's speed signal and reverse gear wires (the latter mainly if you want to use a rear camera — either adding an aftermarket or retaining a factory camera). However, Subaru switched to Toyota-style harnesses for the FT nav — completely different than the harnesses used in Subarus previously. So you'll need adapter harnesses for everything (except USB in some cases). 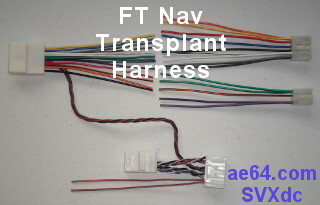 See pictures of the FT nav model FW602US and its factory harnesses in a 2012 STi in this post (post #4 in that thread on NASIOC). Pin-out tables of the harnesses are in this post (post #9 in that same thread). I can supply nearly all of the various harnesses and adapters you will need. For FT HU's camera and parking brake inputs. At a bare minimum, you'll want the parking brake lead grounded, to prevent the FT HU from locking out movie video display and some menus/functions. Price for a harness with only that one wire (looped onto a pin that provides ground) is $10. You can easily add the extra parts to that harness later to connect a rear camera. For a complete 16-pin rear camera harness, see information and prices on this page. 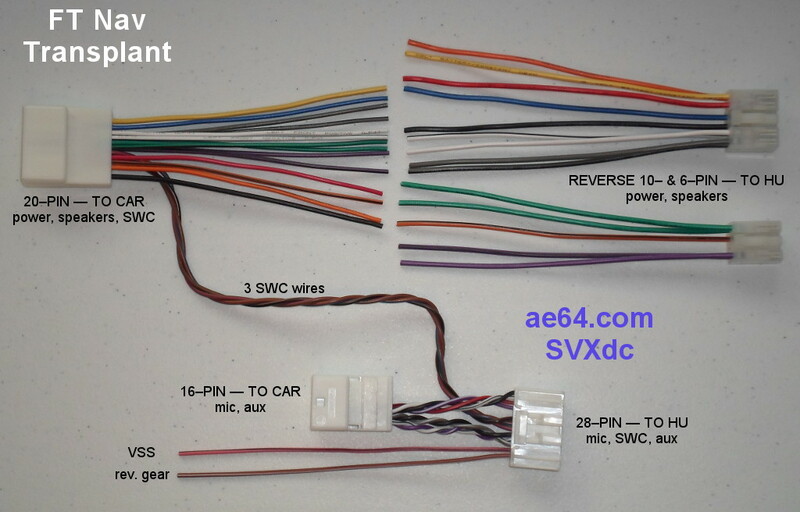 Has female Subaru USB socket (Hirose style), connects to car's factory USB harness (the end currently plugged into rear of non-nav OEM HU) and converts to standard male USB 'A' plug. Cable length (between the two connectors) is 15 cm (~6"). Price $12. 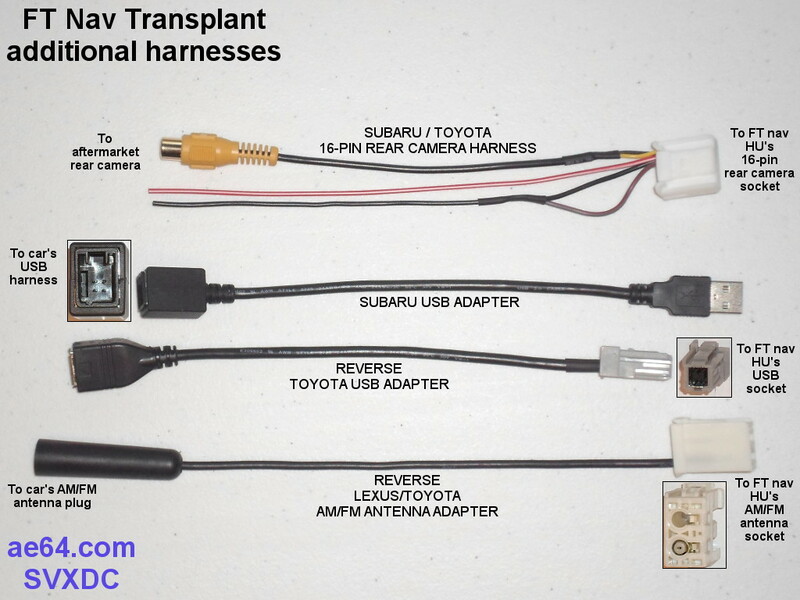 Note: 2014-up Forester and 2015-up WRX & STi already have a Toyota-style plug on the factory USB harness, so those cars do not need this or next item. Converts from standard female USB 'A' socket to male Toyota USB plug. Connects between Subaru USB adapter and USB socket on rear of FT nav HU. Cable length (between the two connectors) is 15 cm (~6"). Price $12. Idea: If you would rather bypass your car's factory USB socket and want to connect something straight into the rear of the HU (perhaps an MP3 player that you leave in the glove box or in the "cubby" below the radio), you can use just this reverse Toyota USB adapter, and skip the Subaru USB adapter. You may need to add a USB 'A' male-female extension cable, depending on how far away you need to reach. AM/FM antenna adapter. Has female Motorola socket and reverse Toyota/Lexus style antenna plug. Connects between car's factory antenna cable (which has a male Motorola plug) to socket on rear of FT nav HU. Price $10. Antennas for some Eclipse HUs have the proper connector. Technically, the connector is made by Sumitomo, in their "HFC" series (High Frequency Connector). The antenna's connector has a Sumitomo female housing F(6098-2724) "Atype" (but you won't see any GPS antenna manufacturers mention that number). Sumitomo considers it "female" because the center contact is a receptacle. The connector on the rear of the HU has a male terminal in the center. That can get confusing, since the antenna connector's housing plugs into the HU's connector. Here's a GPS antenna on eBay from a US vendor, with a good picture of the plug (I know very little about that vendor or the reliability of their antennas). I've seen others on eBay with the same Eclipse plug, including vendors in China. You can also order the OEM GPS antenna from a Subaru parts vendor. Incidentally, the older OEM Kenwood nav HUs use the same connector for their GPS antenna input, and the same antennas work in both types of HUs. This is slightly trickier, since it must have a plug to fit the FT nav HU's socket. Again, it is a Sumitomo, HFC series connector. The car's connector has Sumitomo female housing F(6098-2961) "Btype" (but as with the GPS antenna, you won't see any sat radio antenna manufacturers mention that number). Before you start searching for vendors who sell Sumitomo parts, be aware that the above housing is just one of 5 pieces that comprise the complete female connector assembly. Plus you would need some very specialized crimp tools. You'll be better off finding an off-the-shelf cable that already has the proper connector (even if you have to graft the coax cable onto another cable). If your car has a sat radio tuner from the factory, you'll have a factory sat radio antenna. In some recent models, that is on the roof (in some cases part of a combined AM/FM/sat antenna). On other models, an OEM sat antenna is stuck inside the windshield, at the upper right corner. In some Subaru models, the sat antenna cable that is plugged into the OEM HU or OEM accessory tuner module has a round SMB connector inside a plastic FAKRA shroud. You may be able to replace the final segment (which Subaru calls a "feeder cord") with an alternate OEM piece that has the necessary square Sumitomo connector. I'm investigating OEM feeder cords that may work for some models. Otherwise, you'll need to find an aftermarket adapter, or fabricate one. In any case, you'll need to determine what part(s) you need. At this point, the only other information I have is in this post. The map data is on an SD card. Your FT nav HU should include the one provided by Subaru (check with the seller to be sure). Important: Subaru's FT nav HUs have different SD cards for the different car models and years. A map SD card will not work in the wrong HU model! So if you find an FT nav head unit being sold without its SD card, you must find the appropriate card. Check with a Subaru dealer to obtain the part number. You'll need to tell them the Subaru part number for the FT nav (or you may instead be able to give them the VIN for the car from which the FT HU was taken). I don't have any map data myself, and haven't looked into where you can purchase newer versions or what is the cost. You will need to solder or crimp the 10- and 6-pin power/speaker harnesses to the respective wires on my 20-pin harness (14 junctions). Sorry, but I currently don't have time to do this for you. In cars with the OEM h/k amp, you'll need to connect a lead for the remote turn-on signal to the amp. I'll provide more details where applicable (but most cars and FT nav HUs don't have or need this). Vehicle Speed Signal (VSS) — This will improve navigation position tracking, especially during times that you have poor GPS reception (driving around tall buildings, thick trees, canyons, or under bridges, tunnels, etc. ), as well as when the HU was off for an extended time and it's trying to re-acquire enough satellites. Reverse Gear signal — Mainly needed for the rear camera function, but this may also aid in position tracking when GPS reception is blocked. Posi-Taps are a great way to tap into factory wires. Posi-Locks are a handy (and reusable) way to join two wires behind the HU. If installing an FT nav HU from a BRZ or Toyota, you will need to add a resistor to the aux enable wire (which runs between the HU's 28-pin socket and the Subaru's 16-pin aux/mic harness). The resistor must be connected in series (cut the wire I provide, and solder the resistor between the two cut ends). The resistor value should ideally be 2.7K ohms, but any value between about 2K and 5K will work. Physical installation is fairly easy — open dash, remove your OEM HU, install FT nav HU using my harnesses. At least a hint at where you will want me to ship (ZIP code, if in the USA, or country if outside USA). See this page for shipping and payment options. Let me know if you have any questions.